The concept of removing graffiti instead of painting over it may seem a bit foreign. The time and money that you save can make all the difference when restoring your surface. For those areas where a remover is recommended, it is imperative that you use the appropriate cleaner for the type of surface that you are dealing with. 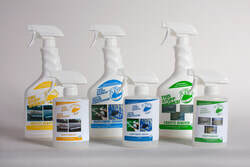 Choosing the right cleaner will minimize any further damage to the surface.